THE 2018-19 SCHEDULE will BEGIN on Tuesday, October 9. 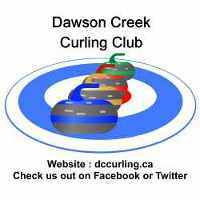 For specific information on the Leagues, please contact the Club Manager Jeff Ginter, 250-782-4080 or email to dccurl@shaw.ca. Junior Monday 4:15 pm Open to all school age curlers over the age of 8 years and all skill levels. Commercial Monday 7:00 pm Open to any combination of age or gender. This is a great open league. Super Monday 7.00 pm For competitive curlers of any gender. Cash prizes. Teams from Dawson Creek and surrounding communities. A mix of gender and very much like "drop in" curling. Teams are selected each day. A great mixer. Mixed Tuesday 7.00 pm Alternate genders at third/skip. Preferred two men/women per team. Open to any age. Open to any combination including those with no or limited curling experience. Fall Learn-to-Curl league, includes free instruction and 9 weeks of play from mid Oct to mid Dec. No more than $125 per player, includes membership. early Jan - late March: winter league, includes min 10 weeks curling for no more than $125/player includes membership. Wednesday 6:45 pm For the ladies of any age who want to have a great evening out.. Elementary Thursday 3:30 pm Each school enters teams and curls with a mentor (adult or older student) who plays lead. Contact your school for more information. Teams of two; a fun and shorter format imitating our new Olympic Sport. Combined with a meal option once/month. A chance to dine, curl and socialize. Games only an hour long. Mixed Doubles rules but teams can be any gender combo.